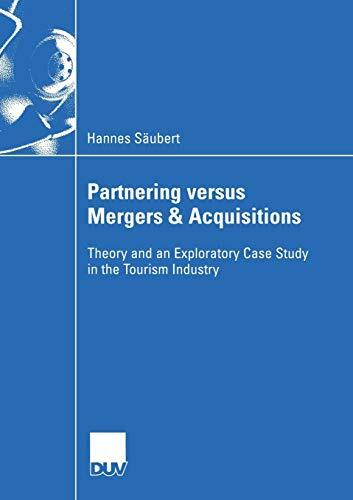 Hannes Säubert addresses the question how firms should decide between Partnering and M&A in a qualitative empirical investigation. The hotel engagements of Thomas Cook, a leading tourism corporation, serve as case study. How should firms decide between Partnering and M&A? Both represent boundary-spanning strategic thrusts related to growth. Both show shifting trends and high failure rates. Despite numerous publications in this area, literature lacks a systematic attempt to provide general decision support. Hannes Säubert addresses the above question in a qualitative empirical investigation. He applies an exploratory case study approach building on developed theory. A conceptual framework and tentative propositions serve as theoretical foundation. Both are derived from a theory assessment covering relevant concepts of research perspectives dominating the field of inter-firm links. The hotel engagements of Thomas Cook, a leading tourism corporation, serve as case study. They cover a wide range of Partnering and M&A arrangements. The author analyzes the case findings in order to assess plausibility and potential for improvement of the theoretical foundation. As a result, he presents an advanced framework as well as testable propositions with regard to the decision between Partnering and M&A.